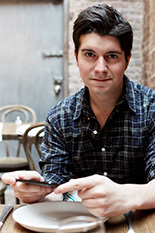 Pictured: Anthony Casalena, UMD Hinman CEOs alumnus and founder and CEO of Squarespace. Ten years ago, in a small dorm room at the University of Maryland, Anthony Casalena set out with a $30,000 loan from his father to change the way websites were built and make it easy for anyone to create one. Now an industry leading, all-in-one website publishing platform provider, the company marks a milestone this Sunday with its first Super Bowl advertisement, titled "A Better Web Awaits." Read more about the ad and preview it in The Official Squarespace Blog, or on YouTube. "Our goal was to create a spot that was appropriate for the Super Bowl while also communicating our values," said Casalena, CEO and founder of Squarespace. "The ad clearly establishes our mission as a company: Squarespace helps sets your website apart from the clutter we commonly find all over the web." Casalena was a member of one of the first cohorts of the Hinman CEOs Program, the nation's first living-learning entrepreneurship initiative, which places entrepreneurial students from all technical and non-technical academic disciplines together in a unique community where they live together, learn about entrepreneurship, and can launch new ventures. "The Hinman Program is a great facilitator of ideas," said Casalena. "The program can connect you with the people you need to meet. It fosters a more professional way of thinking about a business and exposes you to things you wouldn't see otherwise, such as venture capitalists or evaluating business plans. It is valuable for you to see how all of these things work in the real world." With 259 employees and offices in New York and Dublin, Squarespace is one of the biggest publishing platforms on the Internet, serving as a basis for millions of websites. Its user-friendly interface underlies a rich and deep publishing platform with a broad set of features. In addition to dozens of fully customizable templates, each with a unique mobile experience, Squarespace offers simple drag-and-drop website management, blogging capability, modern ecommerce and donation capabilities, social media integration, a full suite of content block types such as photo galleries and events calendars (and no need for plugins), as well as special features for bloggers, photographers, musicians, restaurants and more. Squarespace offers four mobile applications to complement its web-based service, including blogging app Squarespace Blog, photo gallery app Squarespace Portfolio, analytics app Squarespace Metrics, and idea app Squarespace Note. In June 2013, Squarespace's customer care team won a Gold Stevie Award for Customer Service Department of the Year - Computer Services. In April 2013, Squarespace won the People’s Voice Award in the Best Home/Welcome Page category in the 17th Annual Webby Awards. In February 2013, Casalena was named one of Forbes' America's Most Promising CEOs Under 35. In both 2012 and 2013, Squarespace was named by Crain's New York Business as one of the Best Places to Work in New York City. Bootstrapped for six years, Squarespace completed a $38.5 million minority investment from Index Ventures and Accel Partners in 2010. Since then, the company released a complete overhaul of its publishing platform with Squarespace 6, more than doubled is staff and added dozens of features to its system, including its mobile apps. After the Super Bowl, Squarespace's ad campaign will be expanded nationwide and include TV, digital, social, and out-of-home components. The commercials, created in 60-second and 30-second formats, can be viewed at http://www.squarespace.com starting February 2.